This is no ordinary weighing scale. When he steps onto this, he’ll get a full body breakdown; muscle mass, body fat percentage, and more. Most scales just track calories, but this one is packed full of motivation to achieve perfect results. Running outdoors gets tedious when it’s pouring with rain, icy or just plain cold. But that doesn’t mean that the workout has to be put on hold until after Christmas. With this indoor treadmill, he can start working off the turkey straight away, without having to sacrifice any home comforts. This spice rack stand has storage for up to 18 different spices. For the health-conscious man, combining these spices with lean chicken means no end of flavorsome, protein-packed muscle meals. His only limitation will be knowing how and when to use them all. Hitting the gym or running on the road are great ways to keep fit, but when it’s pouring outside or he’s lacking motivation, a DVD workout is perfect. “Insanity” is one hell of a workout, but will guarantee high levels of fitness, not to mention high levels of exhaustion! This roller is a practical aid to help boost his workout, ensuring that he achieves the perfect technique, whilst massaging muscle and soft tissue. It’s ideal for pilates, yoga, running, and more. It can also be used pre-workout to limber up the body. If he’s into yoga, this mat is one of the thickest available, providing specialised support and comfort. If he hasn’t considered yoga before, he should do; this mat would be the perfect introduction to an exercise that is relaxing and restorative to the body’s muscles and joints. Just the ticket for any avid fitness obsessive. These resistance bands can be built into any strength training routine to add variety to his workout. If he’s in a rut, using body weight exercises or weights alone, then these cushioned bands will offer him a new workout that can increase strength and muscle mass through the introduction of different techniques. Most men who are into fitness also take care to look their best at all times. 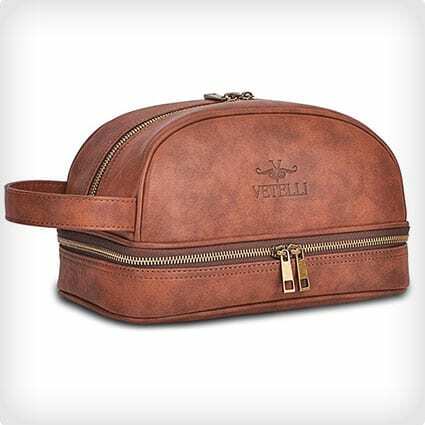 This toiletry bag is made from 100% genuine leather and gives him a safe place for all of his toiletries, muscle rubs and moisturizers, without compromising on the importance of aesthetics. This exercise ball is built to the same spec as any he’d find in the gym. Storage isn’t an issue, with the included pump, which means it can be deflated and inflated whenever it’s needed. This ball is ideal for achieving the perfect sit up, without putting pressure on the spine. Getting a good workout for your abs can be tricky without good equipment, and exercises like sit ups can be damaging for your back. With this gift, he’ll be able to get shredded abs in the comfort of his home, whilst working out his arms and shoulders, too. You can’t get all of the benefits of a good workout without proper hydration, but carrying a bottle just slows you down. If he’s a regular runner, this slimline water bladder will give him all the hydration he needs without hindering his exercise. Listing all of the features included in this bottle hybrid would be impossible here. What we can tell you is that it’s a water bottle, Bluetooth speaker, carry case, LED safety light, USB charger, and more. Truly the Swiss army knife of the water bottle world, if there was such a thing. Getting a lean source of protein in every meal is essential for good muscle growth. 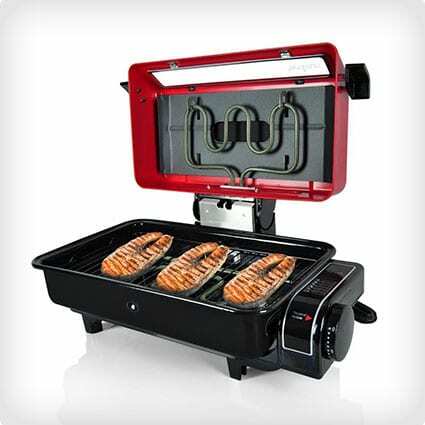 This grill ensures that he can always cook up a protein-packed feast, without creating anything unhealthy. What’s more, it can be done indoors or outdoors, so he can keep active whilst the grill does its job. As much as protein is essential to the muscle diet, vegetables are a great way of packing out a meal whilst keeping it healthy – plus some have protein, too! He’ll appreciate this steamer, which retains all of the goodness of the vegetables, whilst cutting out the need for unhealthy oils or marinades. For indoor cardio exercise, skipping ropes are ideal; they save space that would be taken up by bigger machines, whilst giving you a great indoor workout for when you just don’t want to leave the house. This equipment cuts out the clunky rope, meaning he’ll have less risk of breakages or knocking somebody out when exercising indoors. What an age we live in when you can buy a basketball that syncs with your smart phone. This connected basketball tracks his shots during play, as well as having a number of built-in game modes to improve his technique, with live in-app feedback. These interlocking mats can be used to create a flexible workout area in the home, in the yard, or anywhere else. This will give him a portable yoga, pilates or weightlifting zone. With a high-density foam base, he doesn’t have to worry about damaging the floor if he drops a set of weights or comes crashing out of a yoga position. If he loves basketball, then he’ll love being able to shoot hoops at home with this height-adjustable basketball hoop. The impact backboard is virtually indestructible, so that his slam dunks – or attempted dunks – don’t break anything. As it sits on wheels, he can take the game to his buddies. This isn’t just a comb, it’s a beard comb. Made from pear wood, which ensures a much smoother run than metal or plastic, this comb encourages healthier hair growth and can be coupled with healthy beard oils to keep the hair looking healthy and nourished. For sore, dry skin, there are moisturizers. For everything else there’s the Axe detailing tool. This two-sided sponge is perfect for exfoliating dead skin accumulated during workouts, keeping the skin supple and fresh. Best followed-up with a homemade lotion or moisturizer. The Perfect Fitness pull-up bar can turn any doorway into gym equipment, creating an impromptu area in which to work out the arms, shoulders and back. Flipping the bar over gives him a way of performing situps and pushups at home, too. Up until recently, swimmers couldn’t really enjoy listening to music during a workout. 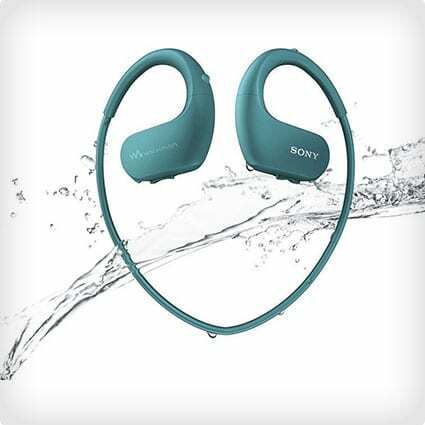 Waterproof tech has changed all of this, as Sony has proved with this compact, waterproof MP3 player. Now, he can enjoy his favorite tracks, whilst smashing laps in the pool. Taking the bike out on a rugged mountain trail or bombing it down a long highway is exhilarating; but sometimes, you just want to keep it local without skimping on your exercise routine. This fixed cycling bike will keep him close to home, whilst still giving him his daily exercise fix. Nothing kills an outdoor run like hitting a puddle and drenching your shoes and socks. Sweat can quickly build up in the socks and cause irritation, too. Forget what you’ve been told about giving socks as a present; he will love this gift. Every sportsman should have a first-person POV sports camera, for capturing those incredible moments and sharing them with the world. This camera shoots in full 1080p so he’ll always have those memories in full HD. If he’s into fitness and has an Xbox, then there’s really no excuse for not having this game. It combines fun with fitness, packing all the benefits of a gym class into a DVD, and all within the comfort of his own home. Even the family will want to get involved. Carbs are a man’s best friend, unless he’s into fitness; then they’re the enemy. But that doesn’t mean he has to shirk pasta, with this spiralizer that turns zucchinis into ribbons of vegetable spaghetti. All of the taste with none of the guilt. When there’s noone at hand to give him a relaxing massage, let technology do the work. This massage tool can target the foot, back, neck or shoulders with kneading techniques to draw out any deep-seated stress or strain from the muscles. If he likes to switch up his running across varied terrain, then these are the shoes for him. They can handle any terrain that he throws at them, whilst providing unrivaled comfort. The design ensures that his feet will be able to breath even when he’s out of breath. Running outdoors is harsh on the knee and hip joints. Keeping up his fitness shouldn’t be detrimental to his long-term health, and it needn’t be with these insoles. They absorb the impact of road running and ease the pressure on the body’s joints, keeping his body healthier for longer. It may contain used water bottles, gym sweats and protein wrappers, but that doesn’t mean that his gym bag needs to be scruffy. Send him to the gym in style, with this authentic leather gym bag. We guarantee he won’t have any trouble getting up for the gym in the morning with this bag in tow. The perfect pushup can be hard to pull off, not to mention the unnatural rotation of the wrists can be damaging over time. He’ll love you for this gift, which makes it far easier to achieve that perfect maneuver for the best results, whilst also protecting his joints. Storage needn’t be a problem when all of the weights he needs fit conveniently into one small package. These adjustable dumbbells can be increased or decreased in weight, simply by switching out the individual weights. For most people, there will never be a need to purchase additional sets for home-use. 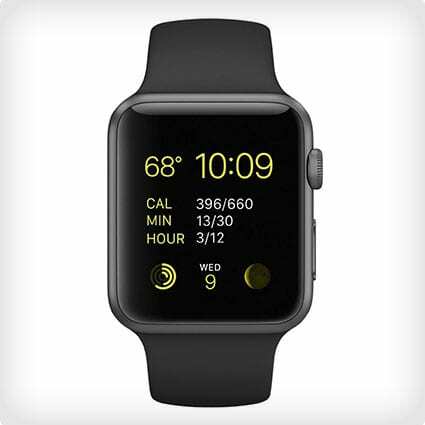 The Apple Watch doubles as both a a smart phone aid and a fitness tracker. All of the important stuff he cares about is right there; tracking vitals, calories, steps and more. Yet he can also keep up to date with friends and family through messaging. This is a watch and activity tracker on steroids. When he’s into fitness, it’s important that his muscles and joints get proper aftercare. These shin wraps help to ward off common runner injuries like shin splits; all he needs to do is just freeze or throw them into the microwave for 20 minutes of soothing relief. Sometimes, the best gift that you can give to a fitness nut is something restorative to help their body recover from an intense workout. If he’s in a desk-based career, then his spine and lower-back will be thanking you for this cushion, which he can position on his chair for all-day relief, getting him back into the game sooner. This product is more compact than resistance bands or chest expanders, but works in just the same way. He can get a ripped upper body workout, without needing a lot of space, and the unit comes pre-programmed with a huge range of workout routines.. Perfect for taking on vacation. When putting together an exercise routine, it can be easy to neglect simple muscle groups like those in the hands. If he’s into cycling, rowing, climbing, weight-training or anything else that requires a firm grip, then he’d benefit from a hand fitness trainer to keep his grip strength at its peak. This sore muscle rub is made entirely from organic ingredients and will provide a much-needed wave of relief for tired and achy muscles. The scents aren’t overpowering and will leave his skin smelling great. Ideal for combating the after-effects of leg day. This nifty bottle doubles as both of a gym water bottle and protein shaker. The shaker provides a protein boost to rebuild muscle after a heavy lifting session, whilst the water bottle can be infused with fresh fruit to add antioxidants to his hydration routine. No matter how much equipment and safety gear he has, it can be easy to neglect something as important as the hands. Lifting weights can put pressure on the joints, as well as pinching and callousing the hands. Protect his hands and support his wrists with these weightlifting gloves. With the constant evolution of smart phones, being out on the move doesn’t mean going off the grid. Using this bicycle phone mount, he can take his music and GPS with him wherever he goes, whilst maintaining full control over the bike and his safety. Just as the title suggests, these are rocking chairs, made out of hockey sticks and Canadian cedar. Need we say more? Perfect for any avid hockey fans, and fans of sitting out on the deck with a cold beer and mother nature. Gone are the days of tangled wires and knocking your headphones off as you run. These Bluetooth headphones will sit comfortable over his ears, without sacrificing on style. You’ll always be able to get hold of him during his run, as these bad boys also feature a built-in microphone for hands-free calling. A solid exercise routine is nothing without the proper diet to support it. If he’s into weightlifting and building muscle, or just toning up a little, then he’ll need the proper protein intake. This book is popular among those looking to build the perfect diet around their routine, for maximum results. It’s time to ditch the armband and switch to a waist pack. This belt is the perfect accessory for holding his phone and playing music whilst running, as it holds the weight of the pack within the body’s center of gravity and prevents the wind resistance that would come with wearing an armband. Though the Frisbee is often seen as a toy, it’s a fantastic workout aide, too. 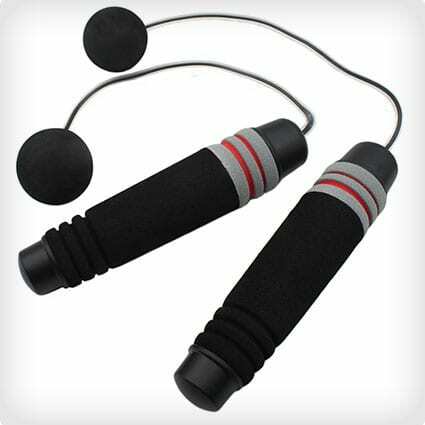 These pro rings are often used for a heavy cardio workout that’s so much fun, he’ll forget he’s even exercising. Just grab some friends or family and head down to the beach or park for a workout that everybody can enjoy. If you’re after a completely unique fitness-related gift, then you’ve found it. These gravity-defying boots can be tricky to get used to, but once he’s there, he’ll be unstoppable. He thinks he can run fast now, but just wait until he’s bounding down the road in these boots. The NutriBullet has come out of nowhere to become one of the most popular and easy to use blenders around. He can quickly throw together a smoothie packed with muscle-food, and detach the blender unit, which also doubles as a drinks container, to take to work or the gym. This is a quirky and thoughtful homemade gift that he’ll love if he has any interest in baseball. These mason jars are jam-packed with small treats and gifts that can be personalized to suit whichever team he supports. You can pack in as much or as little as you like. This moisturizing cream is packed with natural ingredients that carry a relaxing scent, whilst also being packed with essential oils to health dry and tired skin. He can use this anywhere to give his post-gym body some much-needed TLC and hydration. Our feet already suffer enough from long working days and a severe lack of sunlight. When you throw in a heavy exercise routine, they can quickly become tired and sore. This soak soothes the skin, drawing out toxins, whilst also hydrating the skin. If you don’t fancy buying the commercial stuff and want to use your own ingredients, this muscle rub is a gift that he’ll truly appreciate after a heavy workout. It provides soothing relief to achy muscles that are feeling the effects of a long cardio or weightlifting session. To go with his yoga mat, why not design him a homemade leather yoga strap? He’ll be the envy of the yoga class with this strap, whilst having a practical and stylish means of carrying all of his gear with him. These bath salts combine a host of ingredients that have been known for centuries for their healing and restorative properties. After a gym session, he can drop some of this into a hot bath for a full-body detox and repair those battered muscles.